Next week, we will take the second major step in our journey toward retirement in the countryside on what will become Magnolia Hill Farm — closing. The first step was finding the right piece of land. Our real estate agent, Kent, Morris, not only helped us, he has also restored our faith in real estate agents in general. We highly recommend him to anyone looking for land around Pine Mountain. Finding land is a lot like dating — you are unlikely to find the right one without first finding a lot of wrong ones. Land that looked wonderful on Google Maps turned out to have been bulldozed and then left to whatever managed to grow on it afterward. Land that was supposed to have mature hardwoods had a few scraggly scrub oaks and a couple of damaged trees that were probably beautiful before the invasion of the bulldozers. Then we found “the one!” We could not believe that the last piece of land we looked at on a long, discouraging day was a little slice of heaven. Well, maybe not heaven — there are enough briars growing to make walking through some parts of it a painful process. Then there are the current inhabitants — but more about that later. 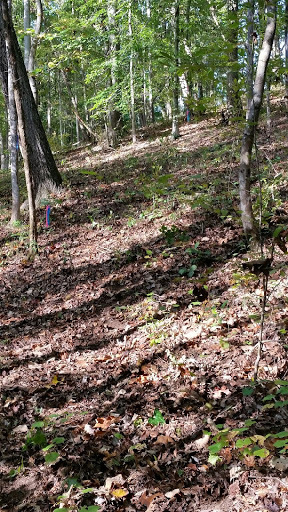 The land is mainly planted pines, but as the land slopes sharply down to a creek on two sides of the property, beautiful old hardwood trees predominate in the areas close to the creek where neither our neighbor, a timber company, nor we can harvest trees. We love this harvesting restriction as we know those two property lines will always be as beautiful and peaceful as they are now. The loading deck created when the pines were once thinned does not currently make the best first impression when driving onto the land, but we see such possibilities for that area. One of our first chores will be to clean up the weeds, tires, and dumped mattresses to see what we really have there. It’s a very small eyesore on a large piece of land, so we see its future rather than seeing its current state. Our plans have so far included a little red school house to store garden equipment, a greenhouse, a shipping container for storage, a garden and an apiary. And, of course, this entry to the rest of the land will be a home for all the magnolia seedlings I hope to have by spring so that the name of the farm makes sense! I’m sure those plans will continue to evolve until after we at least have a place to sleep and bathe! We think we’ve decided on our future home site, but we’ll make our final decision after closing and our meeting with the power company next week. We’ll refine our ideas over Thanksgiving Break and then finalize them over Winter Break. It’s going to be a lot of work, but it will be good exercise and great stress relief! Oh yes — back to the current inhabitants. We know we have deer, wild turkey, and some wild pigs. We also encountered a huge rattlesnake on our last trip. I am now looking for a pair of knee-high work boots to wear and I also pay far more attention to where I am going! It’s going to be an adventure full of surprises. This is fantastic! i am so happy for you and Gene!